Have you ever had a breakout that wouldn’t go away for weeks, maybe even months, no matter which products you threw at it? Did it consist of a lot of small bumps? Was it a little itchy? What you had might not have been real acne at all, but a condition known as pityrosporum folliculitis. Though it looks nearly identical to bacterial acne, this breakout is caused by the fungus pityrosporum, also called malassezia—that’s why many have nicknamed it fungal acne. Google searches for the term “fungal acne” have surged since 2017. The first time someone on Reddit posted about fungal acne—that we could find, anyway—was back in October of 2013. “Curious as to why there is not much mention about FUNGAL acne,” the poster mused, and then explained the condition. Since then, Redditors started posting about fungal acne and commenting on others’ posts and photos, suggesting that their blemishes may be of fungal origin. Then, in spring 2017, the Simple Skincare Science post went up. After that, as Google Trends shows, it was as if a fungal acne bomb had gone off. Many more people searched for it, and acne forum users continued to suggest that breakout pictures and descriptions held clues to a fungal invasion. Malassezia infects hair follicles in a similar way that acne bacteria does. It hangs out down in the follicles, eating oils (whether produced by your skin or added by products) and causing inflammation. Sometimes, dead skin cells get trapped in the area, too. The result is a fungal breakout: often red or skin-colored bumps, occasionally whiteheads, sometimes a mixture of both. Other signs of fungal acne are itchiness, and that all the “zits” appear at once, or are in similar stages, according to Friedman. Because malassezia fungi love oil, they’ll most often congregate in the T-zone (forehead, nose, and chin), but also cause breakouts elsewhere on the face and on the chest, back, and shoulders. They also grow exceptionally well in warm, humid conditions, making pityrosporum folliculitis much more common in summertime and in hot, sticky climates (Singapore and the Philippines, both with warm and humid climates, have the highest rate of Google searches for “fungal acne”). Malassezia also thrives if you sweat a lot. The trouble is, many people ID the condition as bacterial acne, and treat it as such. But that can inadvertently make the breakout worse. Long-term antibiotic use, which is sometimes prescribed to fight persistent acne, can change the skin’s microbial community in a way that gives malassezia an advantage. And without the proper treatment, a fungal breakout can persist for years. And while using benzoyl peroxide and salicylic acid, two common over-the-counter topical treatments for bacterial acne, won’t necessarily make the condition worse, they probably won’t make it any better, since they don’t target malassezia. Plus, as the post on cult-favorite blog Simple Skincare Science points out, those two products are often formulated with chemical compounds that malassezia feasts on, allowing the fungi to thrive even more. Of course, it’s best to see a dermatologist to get a proper diagnosis; as we said, fungal breakouts versus bacterial acne can be impossible to distinguish by looks alone, and aggressively treating what you think is a fungal infection, but is really just regular acne, could make your acne worse. 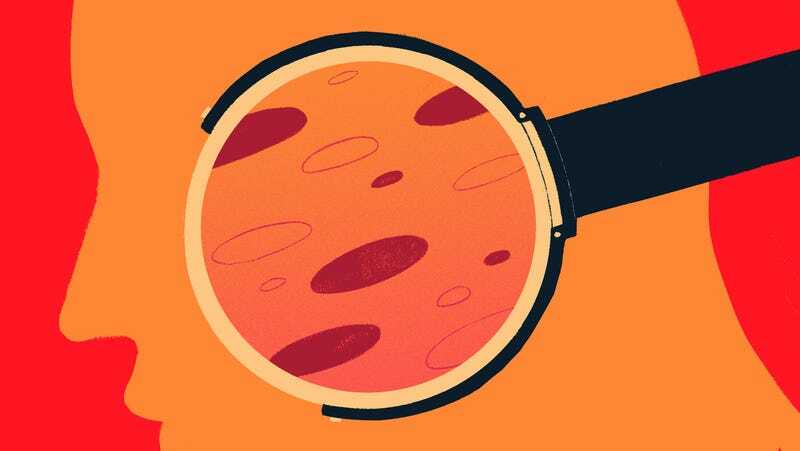 A dermatologist can scrape off a little sample of your breakout—Friedman assured me that it’s not painful—and look at it under a microscope to confirm that you do indeed have pityrosporum folliculitis, not acne. Anthony Rossi, a dermatologist at Memorial Sloan Kettering Cancer Center in New York, also prescribes antifungal meds to his patients with fungal acne. He notes that there are some risks associated with the medication, since it’s processed through the liver. “We council the patients on which drugs they’re taking, and if they drink alcohol,” he said. Drugs like Tylenol and antidepressants are also processed through the liver, and taking too many at once could cause damage. Still, a major barrier to clearing up fungal breakouts is awareness and identification, among both doctors and patients. So if you’ve had a persistent, bumpy breakout for a while, ask your dermatologist for a skin test—you might be harboring an overgrowth of a not-so-cute little bug called malassezia.